Rembrandt Harmenszoon van Rijn (Leiden 1606-1669 Amsterdam), Smell. Oil on panel, 21.6 x 17.8 cm. PhotoÑ Galerie Talabardon et Gautier. THE HAGUE (AFP).- A recently discovered painting by 17th-century Dutch master Rembrandt will be the star attraction at one of the world's leading art fairs opening this week, Dutch media reported Wednesday. 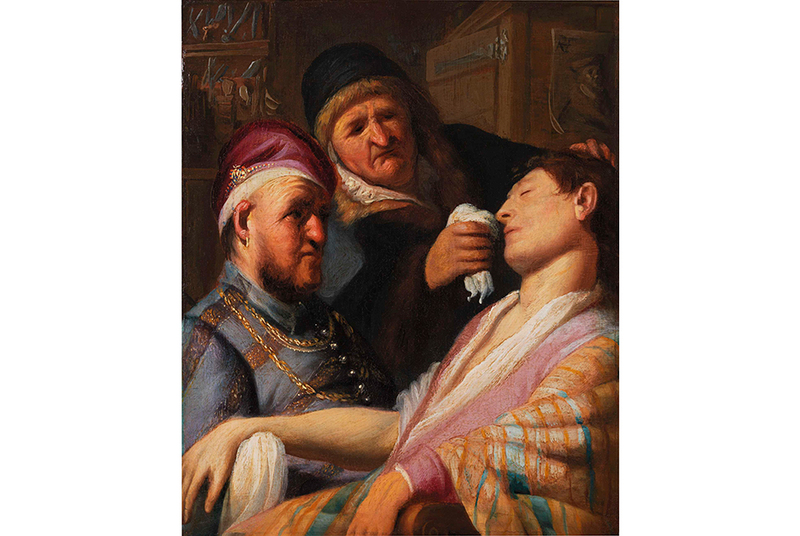 "The Unconscious Patient", also known as "Smell", a small paperback-sized panel believed to have been painted by Rembrandt in his late teens, was uncovered last September when it was put up for sale by a small auction house in New Jersey. "It was peeling at the edges and covered with a layer of dirt," daily newspaper NRC Handelsblad reported. The painting was originally listed with a maximum guide price of just $800 (725 euros). After a frantic bidding war by art collectors who suspected the panel's true origins, it was snapped up by Paris-based art trader Talabardon & Gautier for around one million dollars, said the report. The painting forms part of five panels depicting the human senses which Rembrandt painted when he was 18 and 19 years old and they are among his earliest works. "Smell" depicts a barber or surgeon who has just performed a blood-letting on an unconscious young man, with an old woman attempting to revive him by holding an ammonia-soaked cloth under his nose. Three other panels "Sight", "Hearing" and "Touch" were discovered in the 1930s. "Smell" is unique because a signature was revealed after it was cleaned reading either "RH" or "RHF" -- both of which were used by the Dutch master to sign his paintings. Because the other paintings in the series are unsigned, "Smell" is thought to be the oldest painting signed by Rembrandt, the paper reported. "Smell" will be on display at The European Art Fair in the southern Dutch city of Maastricht, opening Friday. Last year nearly 75,000 people visited the event, exhibiting offerings from 275 of the world's leading galleries representing 20 countries. The newly identified Rembrandt will not be for sale. It was bought by US-based philanthropist and art collector Thomas S. Kaplan for his Leiden Collection at a price estimated between three and four million euros, NRC reported. Kaplan now owns three of the four "senses" paintings. The fourth, "Sight", belongs to the Lakenhal Museum in Leiden. The whereabouts of "Taste" remains a mystery.